Generally when I see a decline in my HRV trend it is because of illness, high stress or significant accumulation of fatigue. However, over the Christmas break I decided to take 2 weeks off from lifting. This decision was based mostly on the fact that I wouldn’t have access to my training facility until after the break. The last time I remember taking this much time off from lifting was back in 2006 when my appendix ruptured and I didn’t get to a hospital until about a 10 days later. I have a nice 6 inch scar on my lower right abdomen to remind me to go see a doctor sooner than later when I feel really sick. Needless to say I was forced to take some time off. Below are some screen shots of my data that clearly show a steady decline in my HRV trend after approximately one week of training cessation. – Above you can see that my last workout before the break was on 12/21 and my first workout back was this Monday (01/07). Between those dates I performed 4 body weight workouts that were largely half-assed. I think my rationale for them was to justify eating all of those high calories meals over the holidays. Without these mini workouts I believe the trend would’ve shown a steeper decline. HRV baseline dropped from about 80 to about 74 by the end of the detraining period. – The steepest dip in the trend came on New Year’s Day as a result of the overeating and drinking from New Year’s Eve. HRV responds poorly to partying. – The high point on 01/03 I believe was the result of a day that included a 1 hour massage, hot pools, sauna, steam room, cold tub etc. – Training resumed 01/07 and as expected strength levels were noticeably down and a workout that previously could be considered a deload was rated as an 8 and caused a pronounced dip in HRV the following day accompanied with extreme soreness. A clear sign that I’ve detrained. The same happened for Wedneday’s workout (01/09). 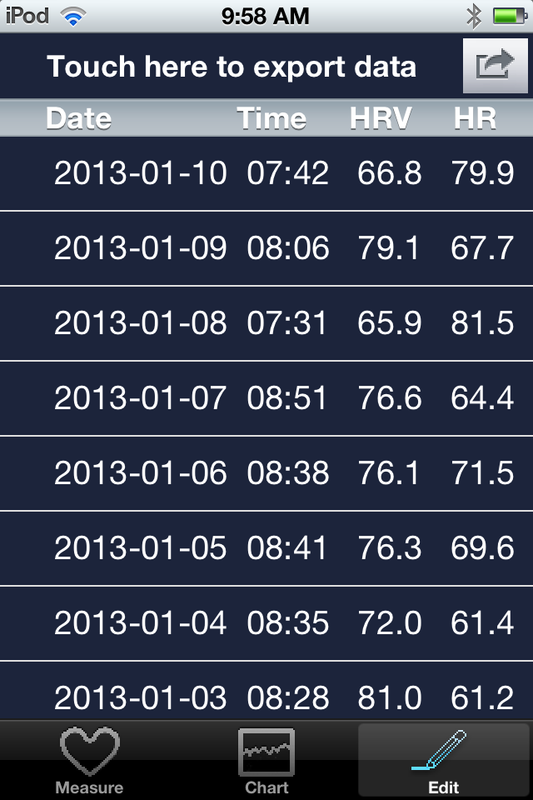 – In the image above you can see that my HRV is lower than usual (baseline is typically around 80). 01/04 stands out to me as a HR of 61.4 is usually accompanied with a high 70’s – low 80’s HRV score but instead HRV is at 72. – Above you can see my 3 month trend charted and my Daily, Week and Month change. 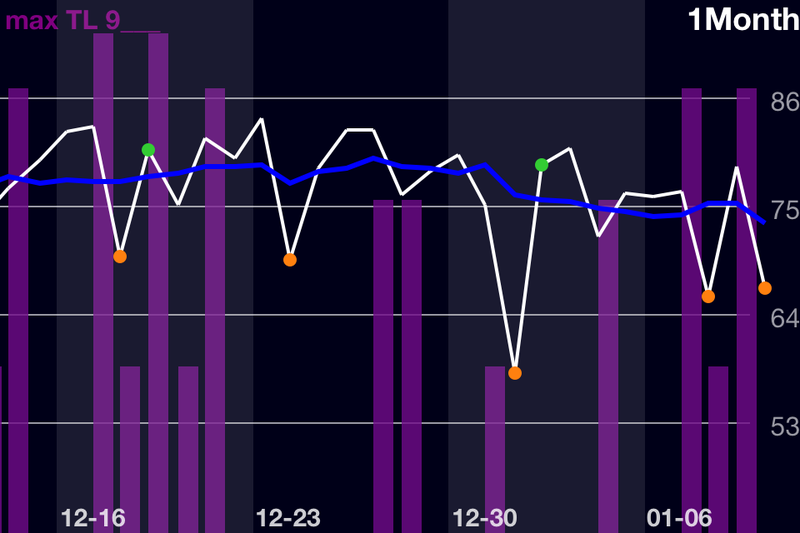 You can clearly see my baseline HRV steadily decline in late December. I can think of 2 stuides that investigated the effects of detraining on HRV. 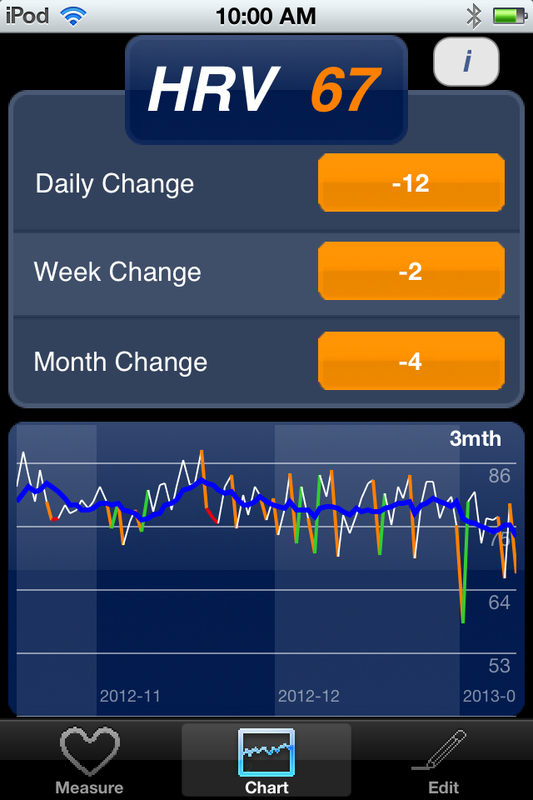 – My declining trend in HRV was reflecting my fitness levels, not my strength levels even though they also declined. My trend would’ve likely remained relatively unchanged had I maintained aerobic fitness. – I’m curious to know what accounted for higher pre-training RMSSD values in those subjects. Were they more fit? Were stress levels just considerably lower? Is this a genetic thing? How does resting RMSSD pre-training effect training response? In research I discussed here, higher HRV levels pre-training resulted in larger improvements in fitness vs. the subjects with lower HRV levels pre-training in recreational endurance athletes (Vesterinen et al. (2011) and in soccer players (Oliveira et al. 2012). – These results obviously aren’t shocking and we don’t need HRV to tell us we are detrained. However, monitoring the trends allows us to ensure favorable responses to training. This becomes much more important in athletes or individuals engaging in intense physical training. Only two weeks of training cessation will result in noticeable decrements in performance and a decrease in resting parasympathetic tone. In the future I will likely perform 1-2 maintenance type workouts each week to maintain strength and fitness levels. This entry was posted in Heart Rate Variability, Training Log and tagged detraining, heart rate variability, HRV, monitoring. Bookmark the permalink. Good stuff my man! If I take a bunch of time off, I will see my HRV normally drop, then go up, and then drop again. On the second drop, it appears that it is related to detraining; so I will start training again. Normally now I will add in a more “cardio” based day, which is really more lactate work around the 40-50 second working time per set with almost complete rest before the next set. If I don’t push myself too hard, I will normally see a bump up in HRV the next day. I am not entirely sure what this is from, but it appears that HRV is closely tied to aerobic fitness. I did another experiment this past July-Aug (6 weeks) where I stopped almost any longer set work (lactate based work) with the exception of a couple days of heavy farmers walks. Almost all of my work was in the 3 or under rep range at higher loads with long rest. I got quite a bit stronger, but my HRV kept dropping like a stone. I felt great for the first 1-2 weeks and then started to feel worse and worse. I had to sleep 9+ hours a night (monitored with Zeo), be completely on point with my nutrition, and any additional stress felt like too much. I felt like I was going to get a cold and be sick any day, and finally stopped. I did rotate exercise variety as my joints were not liking symmetrical lifts day in and day out at heavier weights (squats and deadlifts). I took some time off and when I added back in more longer lactate work, HRV went up again and I started to feel human. I could get less sleep on a night or two and not feel like a complete zombie the next day. Just my ramblings to say that I think aerobic metabolism is linked by HRV and is needed for a good training response long term. Note, I said aerobic metabolism and that you don’t need to run 5 miles every day (I know you know that part, but just for the other readers). I couldn’t agree more about the “indirect” benefits of aerobic fitness on strength training. I feel that some type of work that keeps the heart rate elevated (via intervals or steady state) when not pushed too far will speed up the recovery process and keep HRV at baseline. By doing this on non-lifting days I will see a higher bump in HRV for my next training day. Passive recovery will usually still bring HRV back up a bit but not to the same extent.Followed by another training day HRV will drop again. Without the active recovery work HRV will steadily decline. It seems as though you experienced a similar pattern. It’s interesting to see that you also felt worse as this happened. It’s probably not necessary for work capacity/aerboic (whatever you want to call it) type stuff to be done for shorter strength blocks (as you saw your strength increase). However, over longer term training I feel it will provide significant benefits. Hi Chris, Sorry for the late response. I definitely have to rebuild fitness/training tolerance after a break. I get extremely sore if I take a week or more off from training, so I plan for this by controlling training volume. It usually takes about 3-4 weeks to work back up to where I was before the break. If I start off too hard it will be reflected in my HRV. How long did it take your HRV to rebound back to your “normal” values after the detraining? Did you do anything to purposefully speed it up? I don’t recall for this specific example (posted in 2013). But in general the trend tends to increase back to normal within a week or two once I start training again (despite using lower loads to refamiliarize). However, my performance and work capacity generally take a bit longer (i.e., not occurring necessarily at the same time HRV trend normalizes.) I would bet that including some moderate aerobic work would speed up HRV increases, but if that facilitates adaptation (to resistance training) is hard to say. Thanks for the response. Just wondering if you monitor your RHR as well. I was forced into taking a 2 month break from training due to a chronic illness that decided to come out of remission. I’m still not out of the woods yet, but finally feel like I can start training again. My resting heart rate is about 12-20 bpm faster than when I was forced into the layoff. At first I thought it was the stress from a B12 deficiency, but now after having been on injections for awhile now, I’m starting to think that I’m not going to see an uptick in HRV or RHR from my therapeutic interventions. The number are most likely just due to being detrained. Hope you are able to decipher this rambling message. Basically I’m just wondering if it is normal to see these types of changes from a 2 month layoff and how concerned I should be with the higher RHR relative to HRV? Thank you for your time! Glad to here your health is taking a turn for the better lately! Loss of fitness certainly sounds like a reasonable explanation for the rise in RHR. In the absence of exercise, simply aging will also affect HR markers. Your chronic illness and If you’re on any medications also play a role. Once you’re able to exercise again regularly, you should see a progressive improvement. Generally speaking, I’d like to see HRV (expressed as the ithlete value of lnRMSSDx20) quite a bit higher than resting heart rate. However, you’re in a unique situation given your health status that I’m not qualified to offer advice on. Have you brought this up with your physician?